Containing our exclusive Pro-Collagestine-Fill Technology and Micro-Dermoxine Complex this intelligent eye duo boosts collagen production to reduce lines and wrinkles around the delicate eye area. The day cream works to protect and reduce the effects of micro-tensions (the movements which cause expression lines to form). The night mask stimulates drainage to prevent dark circles and puffiness. Azarole bud extract minimises puffiness and improves micro-circulation. Apply your day cream in the morning before your moisturiser and your night mask in the evening. Use a rice size amount per eye and apply around the eye socket using a gentle tapping movement. Day Emulsion: Aqua (Water), Pentylene Glycol, Glycerin, Stearic Acid, Polymethyl Methacrylate, Caprylic/Capric Triglyceride, Cyclopentasiloxane, Decyl Cocoate, Myristyl Myristate, Polyamide-5, Butylene Glycol Dicaprylate/Dicaprate, Palmitic Acid, Mica, Polysilicone-11, Titanium Dioxide, Cetyl Alcohol, Spilanthes Acmella Flower Extract, Hydrogenated Lecithin, Squalane, Butyrospermum Parkii (Shea Butter) Extract, PEG-100 Stearate, Glyceryl Stearate, Dimethicone, Butylene Glycol, Ammonium Acryloyldimethyltaurate/VP Copolymer, Acetyl Hexapeptide-8, Palmitoyl Pentapeptide-4, Ceramide 3, Carbomer, Polysorbate 20, Caprylyl Glycol, Ethylhexylglycerin, Alcohol, Triethanolamine, Phenoxyethanol, Parfum (Fragrance), Hexyl Cinnamal, Alpha - Isomethyl Ionone, Limonene, Citronellol, Hydroxyisohexyl 3-Cyclohexene Carboxaldehyde, Hydroxycitronellal, Coumarin, Geraniol, Linalool, Benzyl Salicylate. Night Mask: Aqua (Water), Glycerin, Pentylene Glycol, Cyclopentasiloxane, Polysilicone-11, Alcohol, Dimethicone, Hydrogenated Lecithin, Pyrus Sorbus Bud Extract, Chondrus Crispus (Carrageenan) Extract, Betaine, Butyrospermum Parkii (Shea Butter) Extract, Caprylic/Capric Triglyceride, Hydrolyzed Jojoba Esters, Squalane, Hydrolyzed Sclerotium Gum, Hydroxysuccinimide, Palmitoyl Tetrapeptide-7, Palmitoyl Oligopeptide, Chrysin, Ceramide 3, Polyglutamic Acid, Urea, Steareth-20, Glyceryl Polyacrylate, Sodium Polyacrylate, Triethanolamine, Phenoxyethanol, Ethylhexylglycerin, Potassium Lactate, Potassium Sorbate, Parfum (Fragrance), Hexyl Cinnamal, Alpha-Isomethyl Ionone, Limonene, Citronellol, Hydroxyisohexyl 3-Cyclohexene Carboxaldehyde, Hydroxycitronellal, Coumarin, Geraniol, Linalool, Benzyl Salicylate. 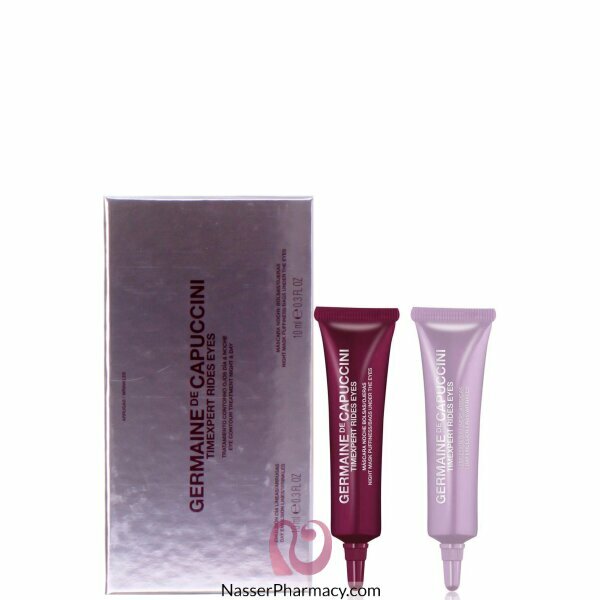 Buy 2 Get 1 Free on Germaine De Cappuccini products, The free item will be the same purchased product, Please be sure that you added the free item to your cart. Don’ t Let your Eyes Reveal that You’re Tired!Eye patches that reduce under eye dark circles, wrinkl..
K-ox Eyes Eye cream to treat and care for bags and dark circles. Benefits: Reduces bags, light.. Description:Deep wrinkles, loss of firmness and uneven complexion. Sensitive skin.Dermatological exp.. There's nothing worse than puffy tired eyes. A unique blend of Plant Collagen, Liquorice an..
A targeted eye goggle mask to plump fine lines + wrinkles. Enriched in plumping hyaluronic acid an..
Eye-deal for waking up sleep-deprived eyes, this featherweight serum features an extremely high con.. Description Immune System Support Standardized Extract &nbs..
Jowaé Revitalizing Moisturizing Lotion 400ml with antioxidant Lumiphenols & Bamboo Water moistu..
Benefits:Non-abrasive, gentle exfoliationPromotes gentle elimination of dead skin cellsTreatments ab.. Description:Bioactive Organic Rose Otto Oil is rich in skin toning and anti-aging properties. In com.. DESCRIPTION :Royal Jelly is the only food that the queen bee of a beehive lives on and it accounts f..
Benefits:Formulated with minimal ingredients for maximum toleranceHelps reduce redness and irritatio..
Jowaé Nourishing Very Rich Cream 40ml is a nourishing cream based on antioxidant Lumiphenols and Cam..
Jowaé Purifying Cleansing Gel 200ml with antioxidant lumiphenols and sacred lotus cleanses and purif.. Description:Pure Organic Rose Otto Oil is an uplifting aromatic essential oil, acclaimed through the..
Calcium provides the building blocks that help keep bones and teeth strong and healthy. * It also sup..
50 ml Pump tubeVery high protection for sensitive skin.Effective against all sun radiation (short an..